I headed back over today to try a trail run with the (improving) neuroma and it was great. Perfect weather, I only got lost once, and my foot didn’t bother me at all. I could feel the neuroma from time to time if I stepped on a root or rock, but it was more of a nuisance/weird feeling than anything. I really concentrated on my hill form and managed to run up most of them, once I really buckled down and paid attention to what I was doing. I’m determined to figure hills out sooner than later after the PD Canyon debacle. Overall, I felt great and this was my third run in a week–not terribly far off my normal schedule. I think I’ll be back in the swing of things soon. Back on Schedule, Thanks Dr. Podiatrist! My doctor gave me a new metatarsal pad that I don’t like, but I’m going to ditch it and begin wearing Correct Toes spacers as soon as they arrive. My foot feels best when my toes are spread apart, so I’m hopeful that the spacers will do the trick. Plus I talked to a former Correct Toes rep at the marathon expo and he swears by them and says you can run in them. I haven’t had good luck keeping my makeshift spacers in between my toes for long periods of time, so I’m really hopeful about this. I’m cleared to return to “normal activities” as long as I don’t have any foot pain, so I did a long run this weekend of 7.5 miles. It was comfortable until my toe spacers crapped out on me and even after that it wasn’t painful, just bothersome. I plan to resume my regular running schedule tomorrow. There’s a 50k I want to do next month, so I need to get some miles in over the next few weeks. 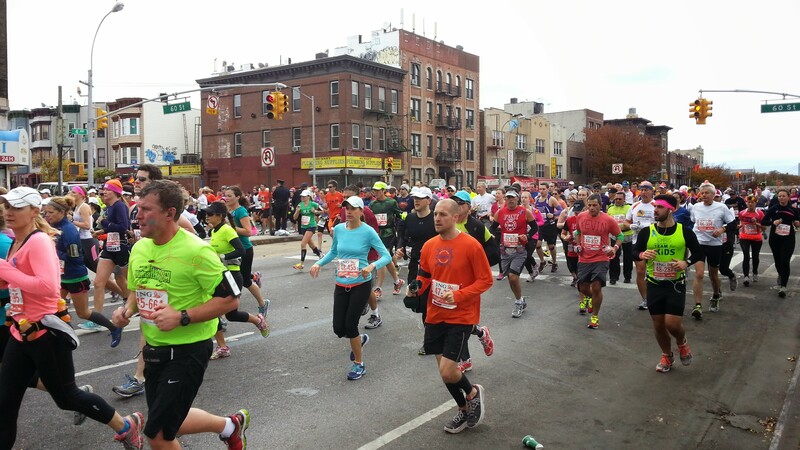 Even if you aren’t running the New York City Marathon, the first weekend in November is MARATHON WEEKEND in the city. I spent the morning cheering on 4th Avenue in Brooklyn. It is always inspiring to see the runners, from the fast ones in the front of the first wave all the way to the slow ones in the back of the fourth. Geoffrey Mutai won the men’s race in 2:08:24; Priscah Jeptoo won the women’s race in 2:25:07. After a couple of weeks off post-PDTR, both for rest and because of a neuroma in my right foot, I finally did a short run yesterday. I call it a success. The neuroma was painful for about three days while I was still in Texas and since then has just been annoying. I’ve been putting ice packs on my foot, taking ibuprofen, using a toe spacer, and wearing super wide shoes with a metatarsal pad. I have a podiatrist appointment in a few days, but I don’t expect to be told to do anything different. I think as long as the neuroma is improving, there’s not much more to be done. We turned the clocks back this weekend, which means running after work in the dark for the next three months. It’s not my favorite way to run.